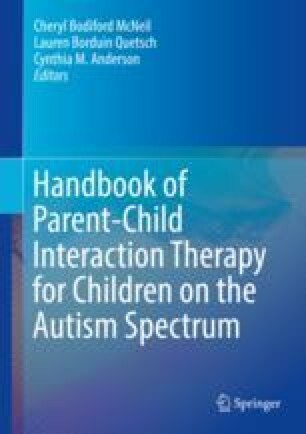 Recent studies have highlighted the efficacy of PCIT with children diagnosed with autism spectrum disorder (ASD) for decreasing disruptive behavior (Ginn, Clionsky, Eyberg, Warner-Metzger, & Abner, 2017; Zlomke, Jeter, & Murphy, 2017); however, little research has examined the impact of PCIT on social engagement or other symptoms of ASD. The current case study used the Gilliam Autism Rating Scale (GARS-3; (Gilliam, 2014), the Dyadic Parent-Child Interaction Coding System (DPICS; Eyberg, Nelson, Ginn, Bhuiyan, & Boggs, 2013), the Eyberg Child Behavior Inventory (ECBI; Eyberg & Pincus, 1999), a social preference assessment, and other novel observational coding schemes. These measures were used to assess the effects of PCIT on child social engagement (i.e., words spoken, eye contact, proximity-seeking, physical touch), pretend play, total ASD symptoms, behavior problems, and caregiver skills, with a child on the autism spectrum. Over the course of treatment, “Charlie,” a 5-year-old Caucasian male, and his mother, showed significant improvements in ECBI Intensity and Problem Scores, caregiver skills, and some measures of child compliance. Observational measures of ASD symptoms demonstrated improvements in pretend play and social engagement (verbalizations, physical touch, and proximity to caregiver). Two other observational measures of social engagement (child eye contact and unique verbalizations) showed potential improvements, but a caregiver-report of total ASD symptoms showed no difference. Results of the study may inform future tailoring or adaptations of PCIT for the unique needs of children with ASD. We would like to thank this family for participating in our research and providing permission for the publication of this case study. Although their names and some details have been changed for the purpose of anonymity, “Charlie” and “Mrs. Brown” were delightful to have as participants. They gave generously of their time and energy to complete additional measures and observations, opening their home to our team for several months. We are grateful to the Browns and families like them who work tirelessly and selflessly to improve the lives of children with autism. Did you practice SDI for 5 min in a social situation? Which skill did you target?